Robbie had a project at school for a makeshift wax museum. They do this every year in the 5th grade class. Robbie was given General Casimir Pulaski. 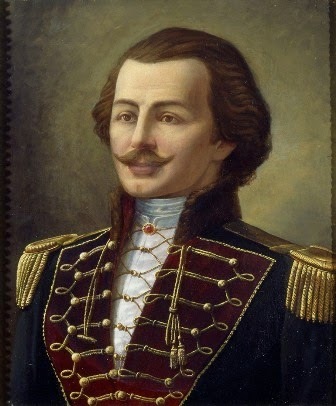 I searched and searched through photos of Gen. Pulaski to find one I could replicate easily. Okay, maybe not easily but doable. I used my latest pattern McCalls 4676. I reviewed that pattern here. I wanted a pull over style jacket that could be easily taken on/off. I used felt so I didn't have to hem or finish any seam. I used a dinner napkin tied at his neck to replicate a shirt underneath. I knew he would get hot. I used shoulder pads under gold lame' for the epaulettes and hot glued fringe to the edges. I taped together my yoke pieces to the front and back pieces and cut them both on the fold. Then I stitched my sleeves in and sewed down the side seams. That left me with one large opening in the top for his head. I marked my center front and measured down roughly 7" from the neck opening and marked. I then measured over 3" on either side of the center line and snipped the fabric at the neck opening. Then I drew lines from those 3" snips down to my mark 7" to get my "V". I cut those lines. I placed a piece of red felt on top and marked the same lines and cut them to match the blue felt jacket. I used fusible web to place it on top. I found gimp the same color as the lame' and tried to replicate the trim on his coat as close as possible. I used hot glue, because I was running out of time. It did not hold up well, so if you try this, stitch it on. I could not find small gold buttons so I found a cheap bracelet at Joann's and took it apart and used those as buttons. I did have the larger gold buttons in my stash. I hot glued all of them on. I should have stitched the larger buttons so I could remove them and reuse. Oh well, maybe he'll wear this for Halloween? Lastly, I wanted something to simulate a white sleeve peeking out from the jacket, so I cut a 4" wide piece of white broadcloth double the width of the sleeve, folded it in half and stitched it to the inside of the jacket sleeve. And that was it for the costume. Then all I had to do was slick his hair back, and he became Gen. Pulaski for the day. He absolutely loved his costume, and that's all that matters. And of course, he had to have one final pose. He had to stand on his podium and wait for others to push his button to come to life. I was so proud that he memorized all of his lines and didn't miss a beat. Thanks for stopping by my little world. Hi Angela! Oddly enough, my second grader has the exact same project in school right now and he is also Casimir Pulaski. Unfortunately, I do not know how to sew. Would you be interested in selling this jacket??? If you would, please email me at janellewojtczak@gmail.com. Thank you! Janelle, I sent you an email.